I need to replace the obsolete satellite antenna on my coach and get more confused the more I research. How important is it to receive both east and west satellites? We've been spoiled by TIVO on cable at home. Am I trying to accomplish too much? All suggestions on antenna and receivers welcomed. 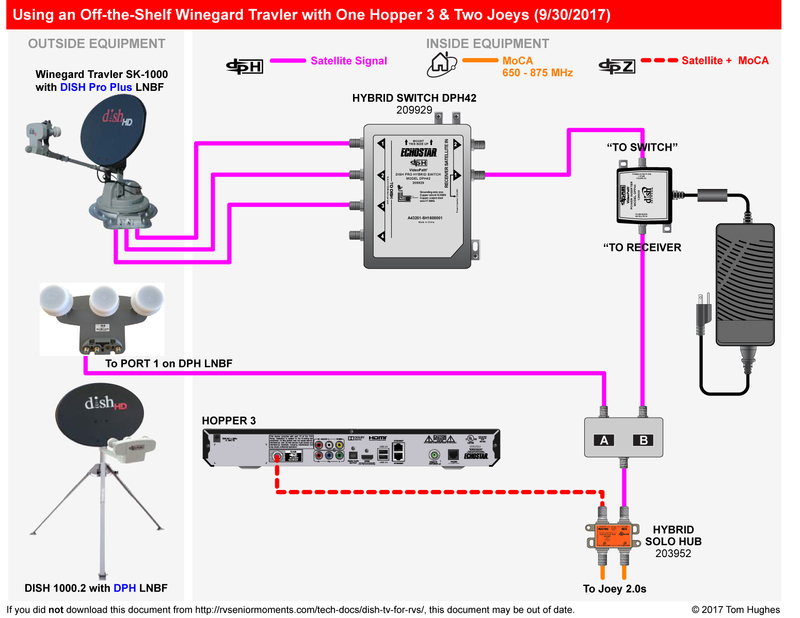 The roof mount antenna that will support all Dish receivers, including the newest 16 tuner Hopper 3 DVR, is the Winegard Trav'ler Dish version. The Trav'ler is a western arc only automatic dish, but it can be manually tuned to one of the eastern arc satellites, 61.5 I believe. Dish recently moved a bunch of primary channels to that satellite, so it's probably the one that would be used the most anyway if the western arc is not available. The downside to the Trav'ler is the $1250 price tag plus installation. The Trav'ler is an excellent choice, as NY Dutch said. My experience is the Western Arc works well, at least as far as NYC area. One problem may be the satellite may be so low in the sky, that trees and hills on the horizon may block the view of the satellite. If you go with the Trav'ler, watch Amazon for sales. A couple or few times a year they have prices in the $1200 range. Another vote for Trav'ler and I've installed mine twice (different rv's). It's a very straightforward installation. Note that dealers do not add to your tradein for satellite antennas so you might as well take it with you. Western arc works anywhere in the US; from Bar Harbor ME to Key West to the west coast. We also had the Trav'ler installed and along with the Dish hopper and joey can record two shows at a time and watch different channels. Have been happy with it other than having to replace the motor under warranty as it simply crapped out and would not stow or deploy properly. It's been about 4 months since the replacement and so far so good, but it was a major undertaking. Looks like the Winegard Trav'ler is the way to go. Can i have the Hopper 3 and Joey installed in my home then transfer to the MH when traveling? How do local channels work when traveling? Can I receive my home channels when in other parts of the country? Yes, you could take the Hopper & Joey from your home with you on the road. The Dish installer may not be willng to set up your RV installation though, but independent Dish dealers often will. You'll need to duplicate the home dish setup for your Trav'ler to use the Hopper 3, but that may be as easy as adding a Dish DPH42 switch to convert the Trav'ler LNB. You'll also need a Dish Solo Hub if you bring the Joey along. A Hopper 2 would only need a Dish Solo Node. The Dish local channels are transmitted to relatively small geographical areas using "spot beam" antennas, meaning you'll lose them once you travel typically 100-300 miles from home, depending on just where your home is located in the spot beam pattern. To get the locals in you new location, you just call or chat online with Dish Customer Service and ask them to change your "service address", but not your "billing address", to the new location. In a few minutes, your program guide will update with the new local channels. There is no limit on how often you can change the service address. I do it daily at times, and have even done it twice in one day with no problems. Dish does offer a "distant network service" that allows you to receive the LA local channels nationwide, but you would lose your locals when at home. Yes, the western arc sats are reachable from most of the US, but there are two good reasons for also wanting eastern arc capability. One reason is when tree cover prevents a view of the western arc from your location, and another is that some eastern local stations are only available on the eastern arc sats now. To get the locals in you new location, you just call or chat online with Dish Customer Service and ask them to change your "service address", but not your "billing address", to the new location. In a few minutes, your program guide will update with the new local channels. Just to be clear, these are not your home locals, but rather the local stations for the area where you are camping. Exactly... Thanks for clarifying that! The Dish version of the Trav'ler will work with the Hopper 3, although Dish may say they don't support it for RV use. The Trav'ler will need a slightly different setup than a typical residential installation, but it's not difficult. The LNB (the "eyes" on the dish arm) that comes with the Trav'ler is not compatible with a Hopper 3, but Dish has a switch (DPH42) that converts it to Hopper 3 compatibility. They are $400 higher than I paid at PPL for the Trav’ler. Hmmm. We got our Tailgater/Wally bundle for about $350.00 IIRC a year or so back when they had a sale going on. The Tailgater is an entirely different critter from the roof mounted Trav'ler referred to. The Tailgater is limited to only the basic Dish receivers like the Wally and older Solo series, while the Trav'ler works with every current Dish receiver/DVR model, including the newest 16 tuner Hopper 3. Ah, thanks. I did not know that. The Tailgater is also a small dome type antenna, while the Trav'ler is a larger dish type antenna which means, among other things, that the Trav'ler will have much less trouble with rain, snow, thick clouds, etc. It also can feed more than one receiver (not sure about the Tailgater). I did go with the Traveler, Hopper 3, and wireless Joey. The system also requires a DPH-42 Switch and A Solo Hub ( not a Solo NODE ). The system works great both at home and on the road. Changing the service address has been easy and painless as we travel. I’ve a fair bit of experience with this setup and may be able to answer any questions you may have.